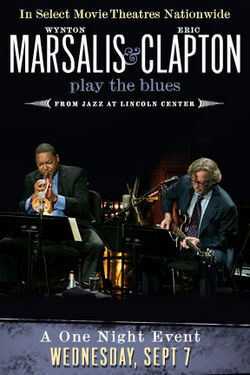 Wynton Marsalis and Eric Clapton Play the Blues was shown in theaters across the country just once, shortly before it was released on DVD. (A CD soundtrack is also available.) It’s what a concert film should be: up close and personal with the musicians on stage, beautifully filmed, great sound, and no silly panning of adoring audience members. Filmed during live performances in the Rose Theater at Jazz at Lincoln Center, the film features Marsalis and Clapton (who have been friends for years) and six members of the Jazz at Lincoln Center Orchestra: Dan Nimmer (piano), Carlos Henriquez (bass), Ali Jackson (drums), Marcus Printup (trumpet), Victor Goines (clarinet), Chris Crenshaw (trombone and vocals). Also on stage: New Orleans banjo master Don Vappie, Clapton’s keyboardist Chris Stainton, and (later) special guest Taj Mahal. Even with two superstars front and center (between them, Marsalis and Clapton have won 29 Grammys), this is a group effort. Everyone solos, everyone shines. Goines’ soaring, dancing clarinet is especially delicious. The cameras bring us near enough to see the nods and smiles of appreciation among the musicians, to hear the occasional “Yeah!” and laughter. They’re having a good time, and so are we. 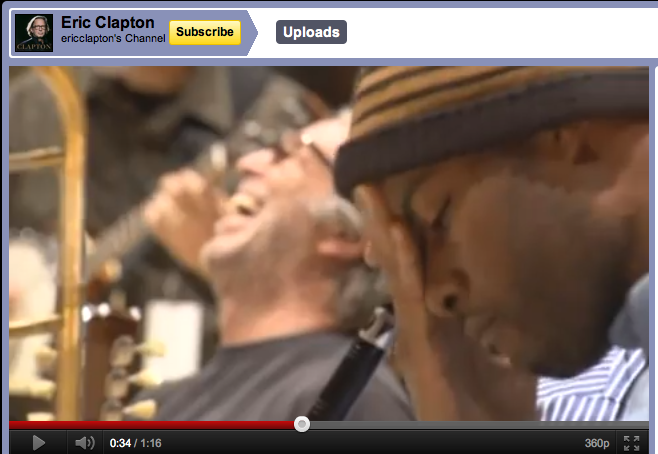 It’s a bonus to be able to follow Clapton’s fingers on the strings and the horn players’ on the keys, to look over Nimmer’s shoulder and stand before Henriquez’ bass. There are occasional moments of rehearsal footage, and a few words from Marsalis, but Wynton Marsalis and Eric Clapton Play the Blues is mostly about the music: traditional, still vital and wide open to interpretation. Marsalis’s liner notes and audio previews of each track. The music is available on Spotify. Clapton’s YouTube channel has video clips. One catches Chris Crenshaw in rehearsal, wearing his Hats for Cats hat.